I've been thinking about a conversation I had about a year ago with an Owner Operator who was parked along side me in a small truck stop in Delhi, Louisiana. It was refreshing to hear someone who seemed to genuinely know what he was talking about, and wasn't trying to blow smoke screens with misleading and convoluted numbers of which I've already unearthed the fallacies of. It made me think about the various things I have heard different Owner Operators say over the years, and I thought it might be beneficial to some of you who are thinking about becoming an owner operator if I put a collection together of the confessions I've heard. I consider the financial risks that an Owner Operator takes on himself to far outweigh the limited possibility of a long term strategy for profits. Let me preface all this with my position on why it is best not to become an owner operator. After having owned a small fleet of big trucks in a manufacturing business I was involved in for many years, I feel I learned a good deal about truck ownership. It is a costly endeavor to own and maintain a Class 8 vehicle, and while they are great pieces of equipment to generate nice amounts of "cash flow," they are really tough to generate sizable amounts of profit with. They are an asset that depreciates very quickly, and the effects of wear and tear on them tends to compound with both age and use. In short, they need to be replaced fairly often, and that in itself is a huge encumbrance to a long term strategy of producing worthwhile profits. The asset that an owner operator bases his profits on is steadily and rapidly decreasing in value and efficiency. Have you ever noticed how so many of the large truck load carriers' recruiting messages include making a point about how often they replace their equipment? Very seldom will you find a major trucking business keeping trucks more than four or five years old. I've been in my current company truck for three years and a few months now. In just a few more months I will have over 500,000 miles on the odometer. At that point it will be considered as an asset to be sold, not maintained. Now if you look at the average Owner Operator they will keep their trucks for many more years due to the high replacement costs, and according to well established numbers developed by the trucking industry, they are cutting into their efficiency and profitability by keeping their trucks on the road for much longer periods of time. How is it that the most successful tucking businesses in the country will go to all the expense of replacing their equipment at benchmark mileage levels so that they can remain profitable, yet owner operators will sometimes keep a truck until is held together with bailing wire and bubblegum? Just take a look at some of the trucks that many of these guys pulling containers from the ports are driving, and you will see what I'm talking about. I'm sorry, I have strayed from giving you my position on why I believe it best to remain a company driver, but I have developed a little bit of background information for you to see why I take the position I do. Basically, I consider the financial risks that an Owner Operator takes on himself to far outweigh the limited possibility of a long term strategy for profits. I am making some really good solid money as a company driver. I found a niche with a company that works well for me, and I have been developing that strategy for my continued success as a company driver. It is really that simple – no financial risks or headaches, and all the money that I get paid is truly mine. Okay, so the gentleman with whom I had this conversation which inspired these thoughts was 67 years old and had been leased on with LandStar for 23 years. I think that gives him some degree of credibility – he is no greenhorn just seeing dollar signs – he is well established at this gig. I am pulling some of his comments from my original post in our forum about a year ago. "...the money was not really any better than being a good company driver, but he does it so that he can be home every weekend (something you can accomplish as a company driver also) and he wanted to run in a certain area of the country - the south." He lives in Alabama. "...there are plenty of company positions which offer regional runs with those options available"
"...not doing any better than he did when he was a company driver years ago, and that as best as they can figure the money part of it, they are enjoying having an expensive hobby." That is the way he described it to me - an expensive hobby! It is rare that I meet with such candor from an owner operator, and I enjoyed talking to him. It was nice not having him try to convince me of the pie in the sky scenarios when it is something that I already have an understanding about. ...originally the truck had a regular sleeper, and he wanted to get one of those really nice big ones. His wife was against it because of the incredible expense of it. He convinced her to let him spend some more money on their "hobby" by telling her this: "Well, you know honey, I have only got two vices. That is big trucks and little women. Somehow after all these years I've ended up with a little truck and a big woman!" Haha! After that comment she gave him permission to go ahead and have his big truck! 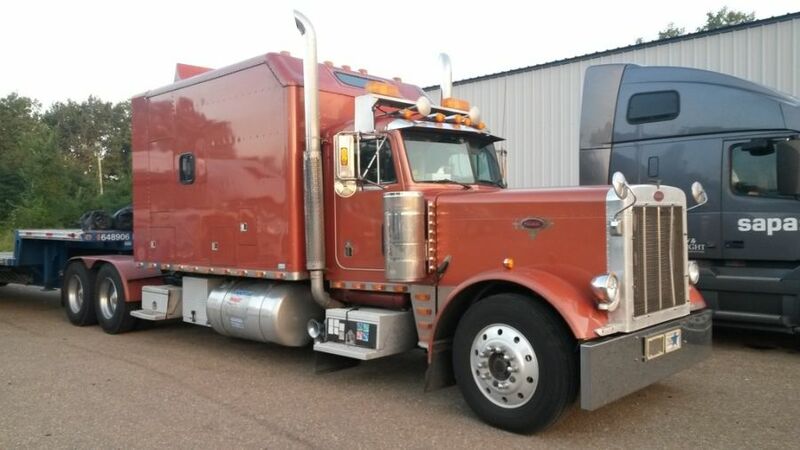 He did have a nice looking Peterbilt truck, with one of those grandiose sleepers on it, but if you look at what he is saying, it sounds as if they are sinking everything they've got into their "expensive hobby." Remember the thoughts I shared with you earlier about the expense involved of replacing worn equipment? Here I was having this conversation with this guy and I, the lowly company driver, am driving really brand new state of the art equipment, while he is driving a 1993 model truck that is 23 years old! Do you realize just how expensive it is for an owner operator to suffer the down time for repairs? As a one truck operation there is nothing coming in for revenues when you are down, but that never ending outflow of cash for payments and insurance, overhead, and personal bills never stops or slows down. I want you to see some of the other "confessions" that the discussion in our forum brought out from our members. Take a look at what "Bud" had to say. Bud was a hard working individual who had leased a truck from a major carrier, and was always honest with us about his experience. He did a fine job of it, but he felt like he came up short after it was all said and done. "All I'm going to say is I have a lot of business experience, I tried leasing (granted, not the best lease program available, but probably about average), and everything Old School and Brett warned about came true. It was pretty good for a while, then pretty bad, and now they're still trying to get money from me four months after I left!" "Bud sorry it didn't work out for you, failure rate is pretty high. You're story is probably more the norm than mine." In fact, Brian acknowledged that failure is more the norm! Do you really want to take a leap into a business model where the few people who are pulling it off acknowledge such things about it? "I am out for 12 to 16 weeks at a shot, I rarely see a 34 and the truck never stops moving more than 4 to 6 hours." "So far this year leasing my fixed and variable costs are 82,000"
"In the past 2 years I've put 450000 miles on my freightliner." "we are on week 12 since home time"
So, there you have it. Some interesting confessions that I found right in our own forum conversations from well meaning owner operators who are living the life. I leave the determination up to you as to whether this is a good investment of your time and treasure. For me it is clearly not worth it. I make great money, have all kinds of privileges that the top drivers get from their dispatchers, and I go home when requested. I am living large on this job, and I have only to answer to myself when it comes to the amount of success I experience at this. I can't think of any other form of employment that has more to offer in terms of freedom to choose how I want to manage it, and I get to measure out my own income by my performance. Man, this is a lot like being self-employed without all the headaches and worry. I'll take that any day!